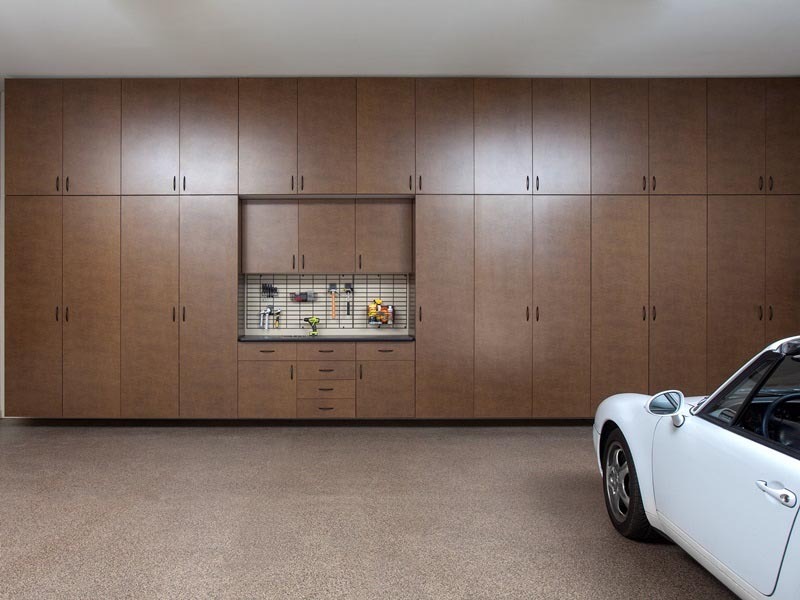 Transform your garage from turmoil to tranquility with our complete line-up of garage flooring, garage cabinets and storage solutions. Imagine an attractive garage floor that brightens your space, is spill and stain resistant, and easy to clean; you can have it all! We offer stylish and spacious cabinetry systems built to last a lifetime. They're wall-hung, so there's no where for pests to nest! 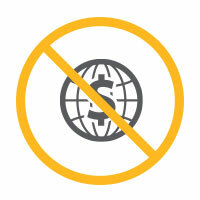 Avoid junior designers from national brands. We will send an experienced and talented space designer to your home who will create an initial 3D design of your dream closet based on your needs and feedback. Get high-end, custom cabinets with high-end accessories at 30% less. 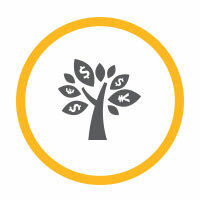 Since 2005, we have been helping Vancouver homeowners transform their garages into functional and organized spaces. We offer complete garage improvement solutions, including garage flooring, storage cabinets, overhead storage, and wall organizers. Our garage flooring application is the most reliable floor coating system on the market. It is commercial grade concrete floor resin which works to enhance the look and functionality of your garage space. We offer a wide array of decorative floor finishes as well as high gloss solid colors which are attractive and easy to maintain. Our garage cabinets are are built to last. 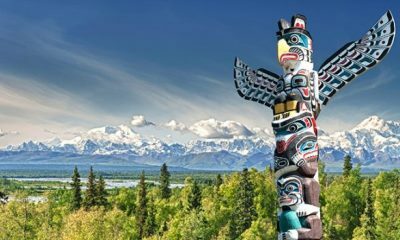 They are designed to withstand extreme shifts in temperature, heavy loads, and will resist warping, sagging, and de-laminating. We offer a variety of colors and finishes so you can seamlessly extend your home's style into your garage. 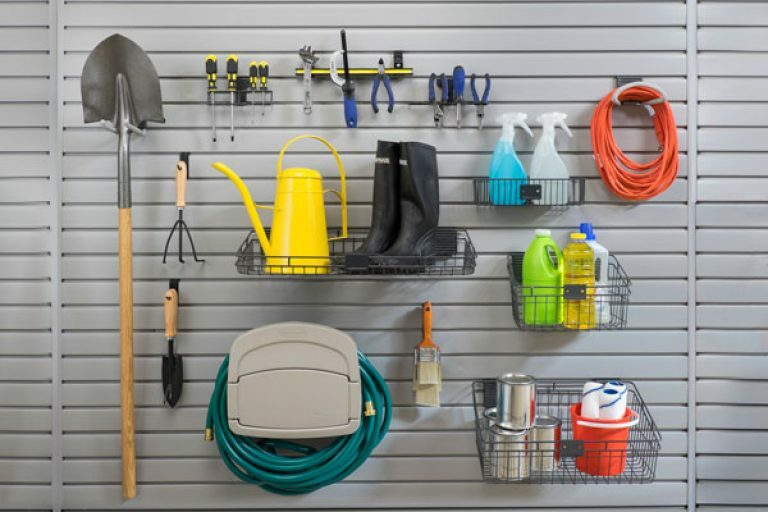 Our garage wall organizer system help you to organize household items, garden tools, work tools, and sporting equipment. We offer a variety of versatile and affordable garage organizers, hangers, wall racks, shelving units, and overhead racks. Our wall organization panels, called "Slatwall", are installed into the wall so that you can attach and move around the accessories and hooks without drilling and re-drilling into the walls every time. We offer several garage storage and shelving options to help you manage and organize your space. 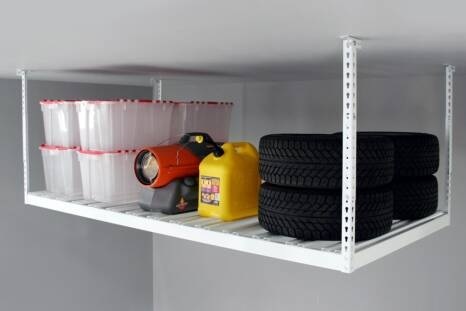 Our overhead storage solutions are simple and affordable, and they are perfect for storing tires, holiday items, tools, and other items that clutter your space. Our team of designers work hard to help you get the most use out of your space. A garage transformation from top to bottom with garage flooring, a workbench, overhead cabinets and a Slatwall organization system. The garage cabinets are a powder coated Granite finish, and the counter-top is stainless steel for increased durability. 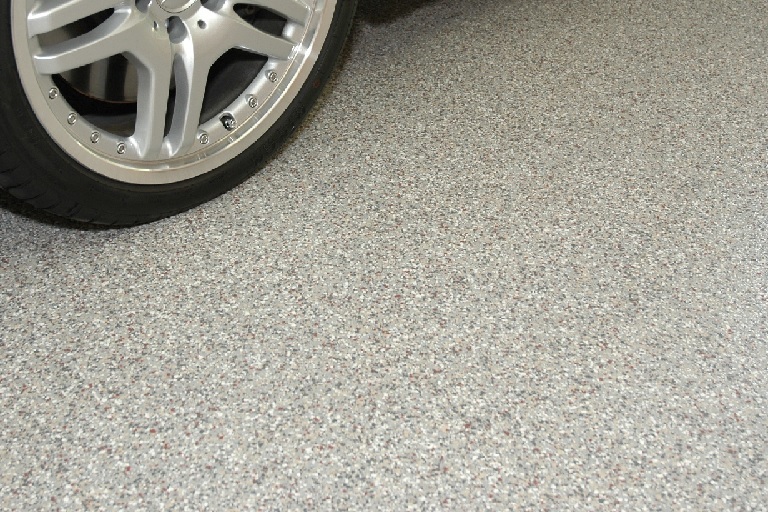 The garage makeover is complemented with our highly attractive and highly durable garage flooring in Graphite ¼" finish. A complete wall of garage storage cabinets, in a three bay garage with 12 foot ceiling was the perfect solution for this client. This home based business owner was looking for ample storage space for all of her business records as well as household items and camping gear. In addition, a six foot counter-top and work station was incorporated for the boys to store all of their hand tools and work on small projects. Welcome to your dual purpose entertainment center/work shop. 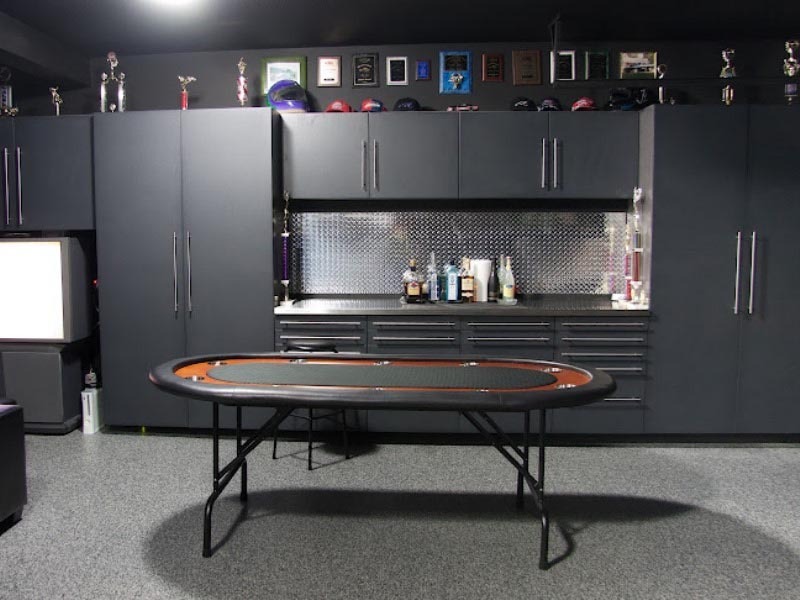 This client wanted an area to entertain guests, play video games and poker, as well as a space to work on his race-car and bike. 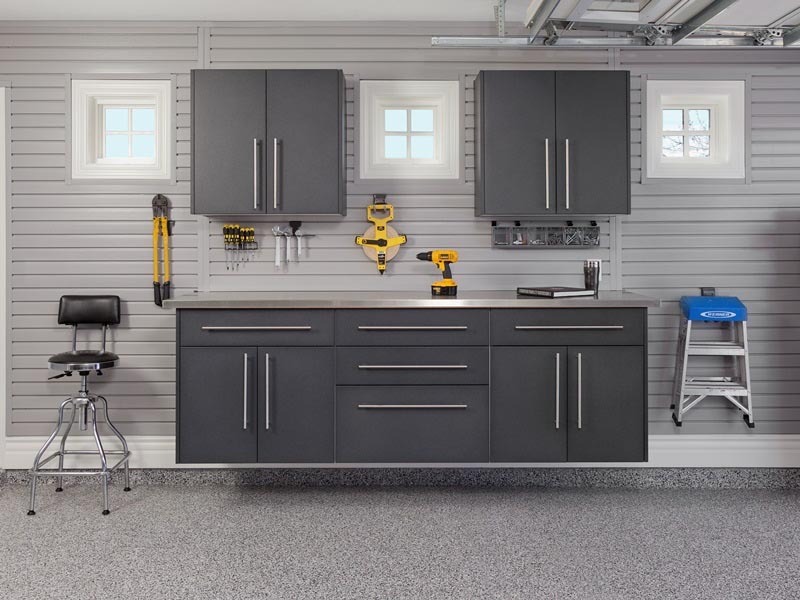 The garage features a dramatic black ceiling with an 8’ workbench in stainless steel and drawers for all of his tools. 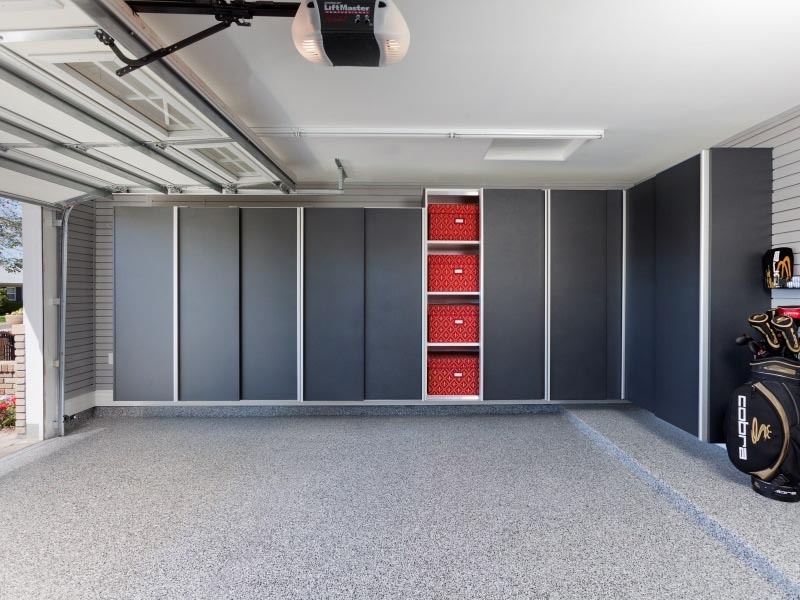 The garage uses garage floor coating in Graphite ¼” finish and powder-coated garage cabinets in Granite color. A garage storage and counter-top system designed for two, so each person can have their own space. 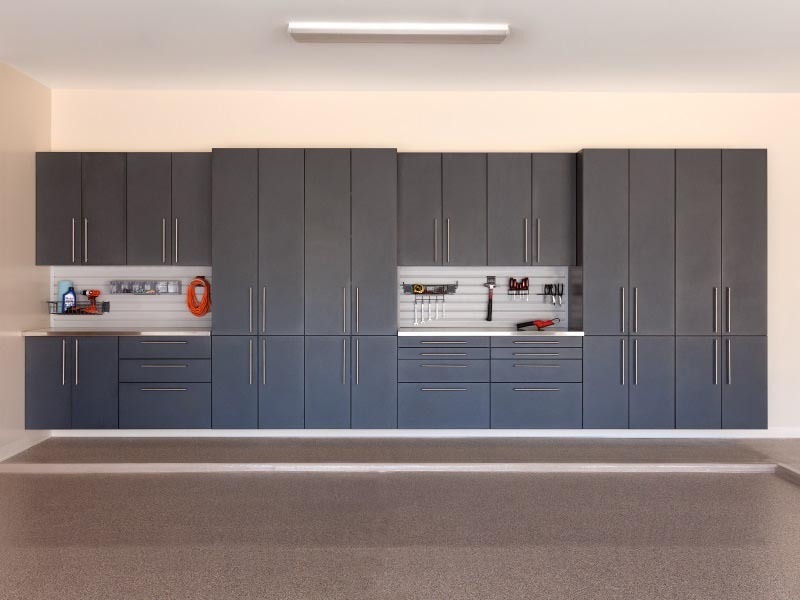 This garage transformation utilizes stainless steel counter-tops and Granite powder coated doors. Lots of drawers and overhead cabinets, paired with two over-sized storage cabinets fully maximize the storage on the wall. All of this is complemented with our state-of-the-art garage flooring in Sedona ¼" to create a space that you won't want to leave! A complete transformation of a tight two car garage. In this project we needed to design the garage in a way that still allowed two cars to be parked, while providing storage space for seasonal items such as Christmas and Halloween decorations, as well as camping gear and gardening supplies. Using bypass sliding doors on our garage cabinets allows access to the cabinets while the cars are parked in the garage. The cabinets are finished in Powder Coated Granite and paired with a grey Slatwall organization system. The floor coating is Smoke ¼". 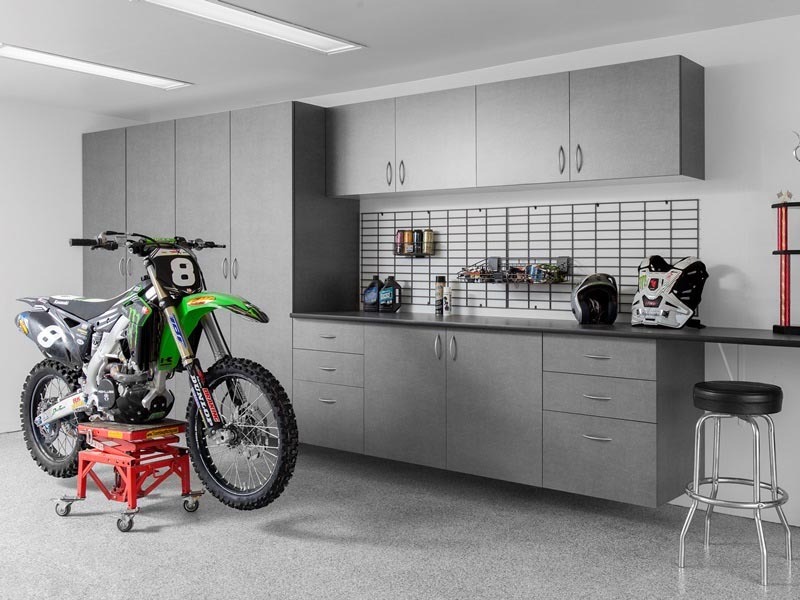 The photo shows a complete garage transformation for a professional biker. 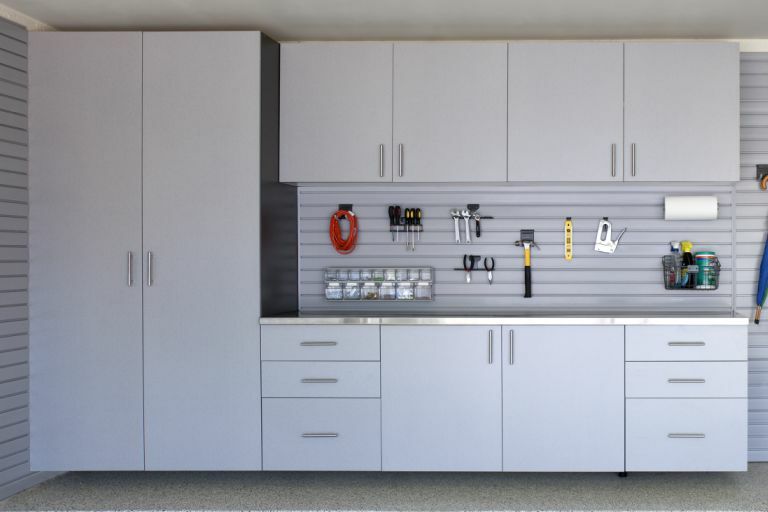 The garage features garage cabinets in a Windswept Pewter finish, garage flooring in Smoke 1/8", and a gridwall organization system mounted above the counter. A 10' long counter space is provided for fixing and maintaining bike parts and accessories. Knee space under the counter on the right is designed to provide proper sitting space, as well as an area to place a compressor. 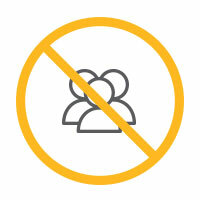 In most households, many items that need to be stored are seasonal items that do not require frequent access. A simple solution is to add storage cabinets on the passenger side wall of the garage. These tall cabinets provide ample storage while fitting in with the current garage floor and overall colours in the home. 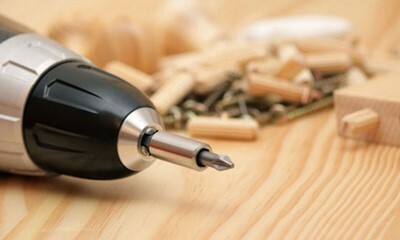 At Clever Quarters, we recognize that you have plenty of options when it comes to remodeling your space. That’s why our team is comprised of only the most customer oriented, trained professionals that go above and beyond to ensure your experience is nothing short of extraordinary. 12 years of experience in custom garages storage solutions and garage flooring for Vancouver homeowners and builders means we have the knowledge to help you, build your dream space. 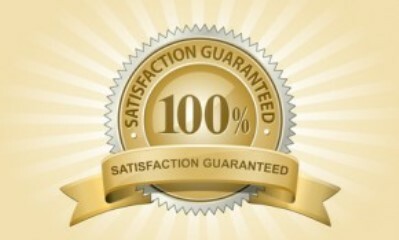 We are committed to excellence in customer service and total satisfaction and we back it up. 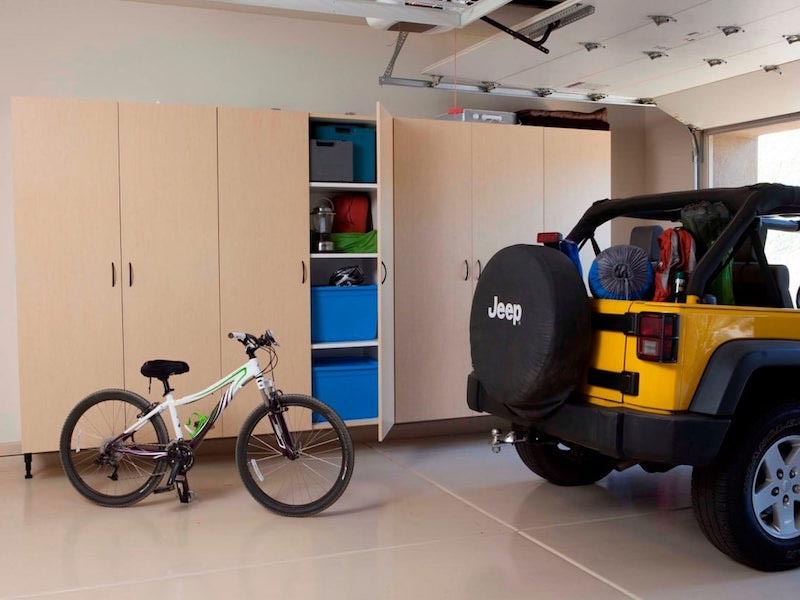 Our garage organization systems are backed with life-time warranty! 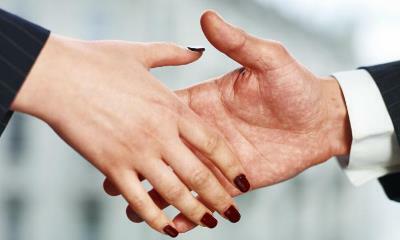 We work hard for your trust by providing the professional, courteous service you deserve. We are passionate about delivering the best value and care. Our reputation proves it!